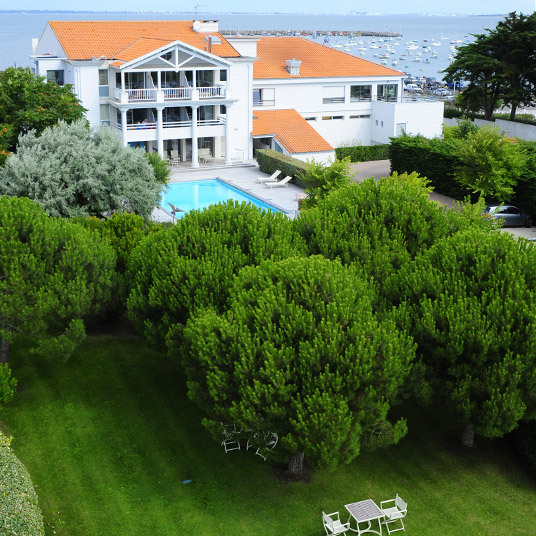 On the southern side of the Breton peninsula, not far from Nantes, is the seaside town of La Plaine-sur-Mer, and here, overlooking the dunes and the waters of the Bay of Biscay, is the big, bright and airy Anne de Bretagne. And while we’ve criticized French hotels at length for an unwillingness to change with the times, Anne de Bretagne is a welcome exception — a seaside hotel that retains its essential charm, even as it displays, in its design and décor, an awareness of what a 21st-century hotel ought to look like. It’s subtly contemporary, anyway, hardly an avant-garde design showcase — just a penchant for generous spaces, simple palettes, modernist furniture and simple, uncluttered décor. Maybe it’s our American roots showing through, but there’s something almost Big Sur about it; sensible enough, perhaps, given that both places find common ground in dramatic sunset-facing sea views. In terms of organization, however, Anne de Bretagne is unmistakably French. It’s run by a Michelin-decorated chef and his award-winning sommelier wife, and the kitchen shows a dedication to food and wine that (much as it pains us to say it) leaves California in the shade. Anne de Bretagne is located 35 miles from Nantes. For assistance with transportation, please email CustomerService@TabletHotels.com.